An Azure virtual network (VNet) is a representation of your own network in the cloud. You can control your Azure network settings and define DHCP address blocks, DNS settings, security policies, and routing. You can also further segment your VNet into subnets and deploy Azure IaaS virtual machines (VMs) and PaaS role instances, in the same way you can deploy physical and virtual machines to your on-premises datacenter. In essence, you can expand your network to Azure, bringing your own IP address blocks. Read the virtual network overview if you are not familiar with VNets. This document covers creating a VNet by using the classic deployment model. You can also create a virtual network in the Resource Manager deployment model by using the Azure CLI. FrontEnd, using 192.168.1.0/24 as its CIDR block. BackEnd, using 192.168.2.0/24 as its CIDR block. You can use the Azure CLI to manage your Azure resources from the command prompt from any computer running Windows, Linux, or OSX. If you have never used Azure CLI, see Install and Configure the Azure CLI and follow the instructions up to the point where you select your Azure account and subscription. 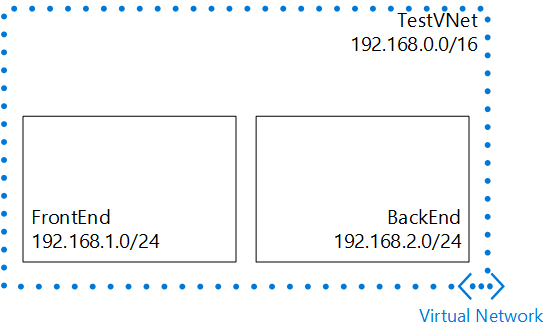 azure network vnet create --vnet TestVNet -e 192.168.0.0 -i 16 -n FrontEnd -p 192.168.1.0 -r 24 -l "Central US"
-i (or -cidr). Network mask in CIDR format. For the scenario, 16. -n (or --subnet-name). Name of the first subnet. For the scenario, FrontEnd. -p (or --subnet-start-ip). Starting IP address for subnet, or subnet address space. For the scenario, 192.168.1.0. -r (or --subnet-cidr). Network mask in CIDR format for subnet. For the scenario, 24. -l (or --location). Azure region where the VNet is created. For the scenario, Central US. + Looking up the subnet "BackEnd"
-t (or --vnet-name. Name of the VNet where the subnet will be created. For the scenario, TestVNet. -n (or --name). Name of the new subnet. For the scenario, BackEnd. -a (or --address-prefix). Subnet CIDR block. For the scenario, 192.168.2.0/24.